The Quick Grip Chill lets you move light and fast, but holds enough water for a substantial run. There is a zipped pouch with just enough room for the three true essentials: keys, card and phone. The extra stretch mesh pouch expands to fit an energy gel or two, and the velvetex-lined strap won't chafe your hands over the long haul. 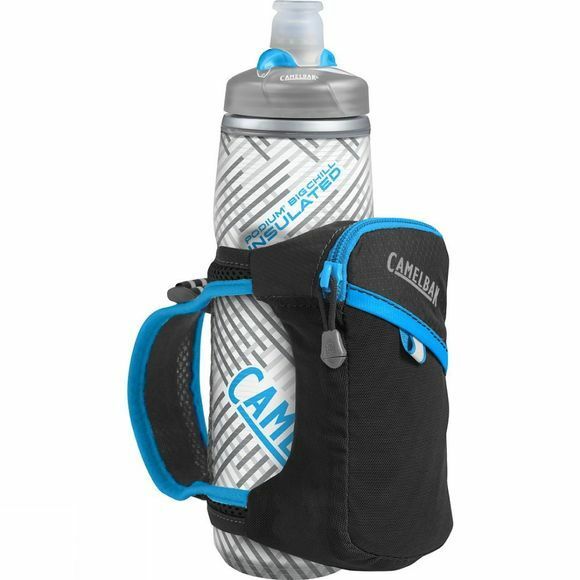 The insulated Podium Bottle keeps your drink cold from start to finish. It is made from TruTaste polypropylene with HydroGuard, which lets you taste water – not the bottle. It also features Jet Valve technology with a lockout dial for leak-proof transport.